While I’m out visiting Los Angeles, we have a series of guest dispatches from Paris! Please enjoy the first of three posts & photos by Alden Gewirtz below. 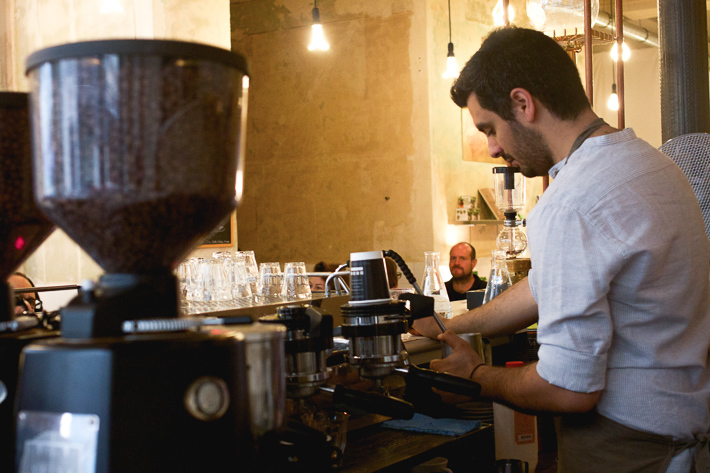 In the past few years, as the coffee revolution in the States and Australia started brewing in the post-Starbucks era, it became cliché for Americans to complain about the quality of coffee in Paris. It was often described as muddy and bitter. Bloggers stopped writing these clichés when the new wave of coffee places like Coutume Cafe, Cafe Lomi, Telescope and others started to appear a few years ago. I am not really a coffee-snob myself, but I do like a good quality cup of coffee, so on a recent visit to Paris, with my wife (a tea drinker), and daughter (partial to hot chocolate) in tow, I decided to find a place we could all enjoy. 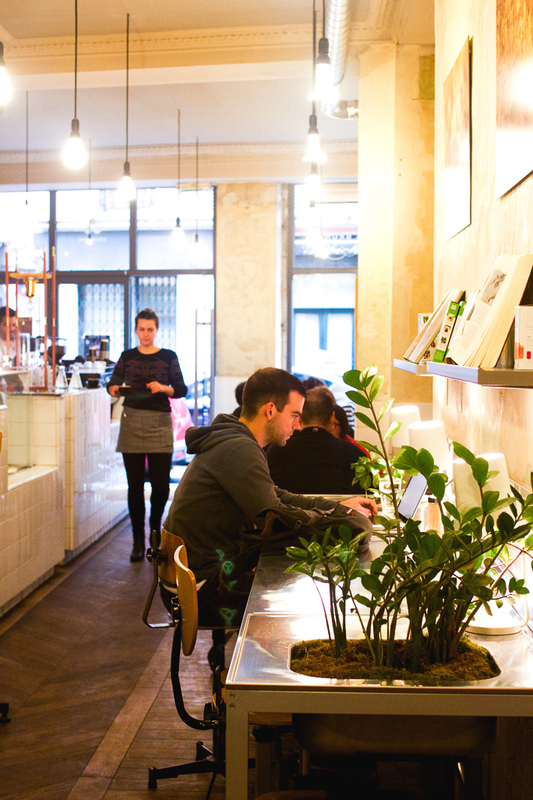 In a neighborhood not often described in tourist guides, Coutume Cafe (47 Rue de Babyonne, Paris, France) has been sought out by locals, ex-pats, and in-the-know tourists, with good reason. 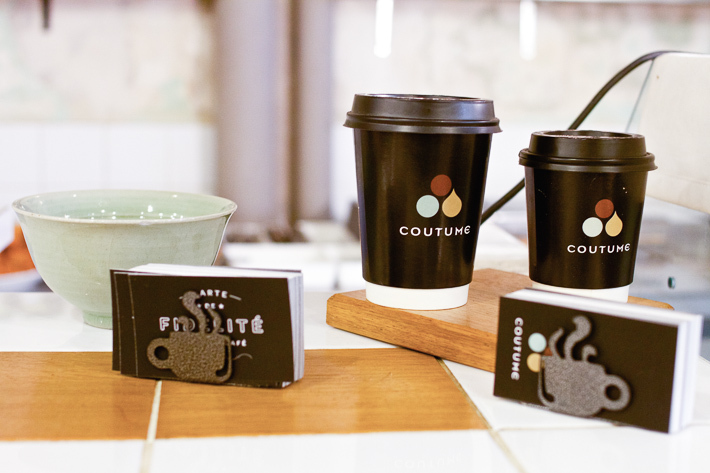 Coutume raises the quality of Parisian coffee with a scientific theme. 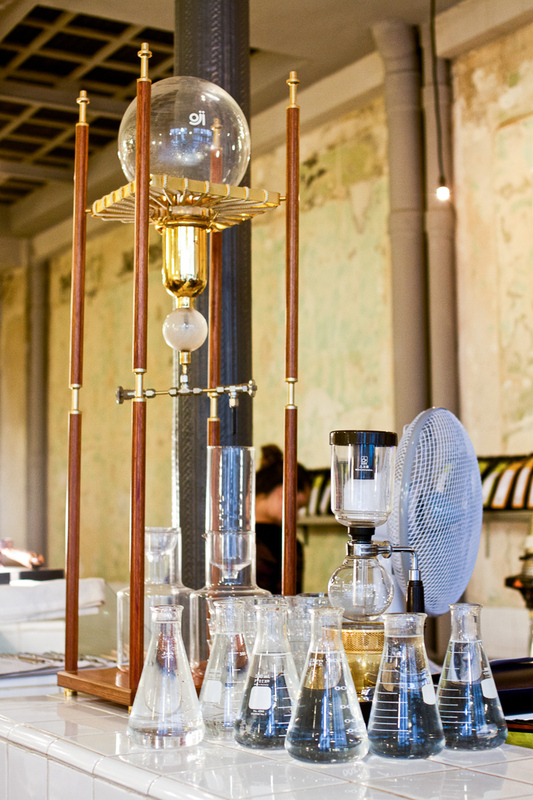 Walking in you can’t help but notice the tall 19th century-looking siphon, with laboratory beakers beside it. These are just the most obvious examples of the scrappy lab theme of the place. 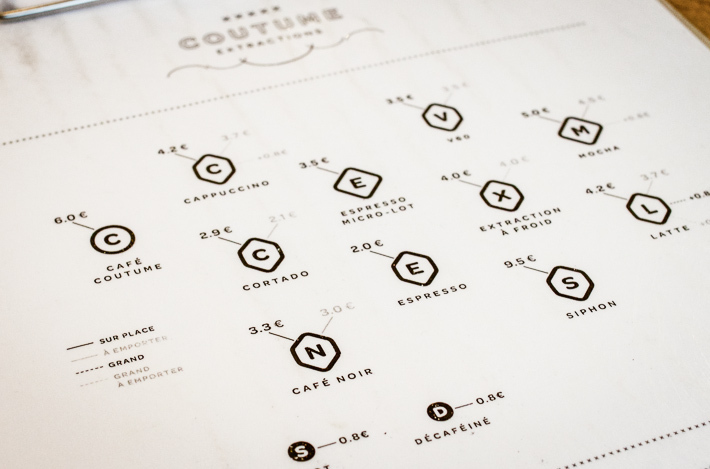 The laminated menus on clipboards list the drink options (and country of origin) in graphics that look like chemical compounds. 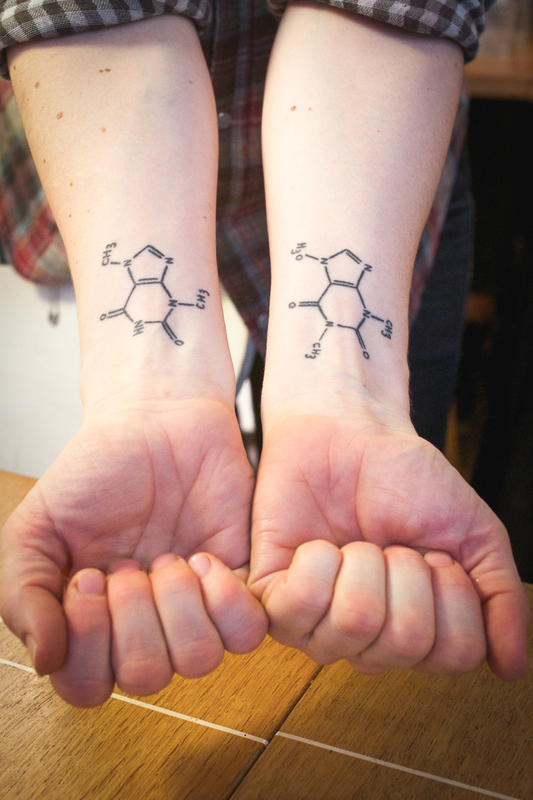 One of the baristas even had a tattoo of the chemical composition of caffeine. 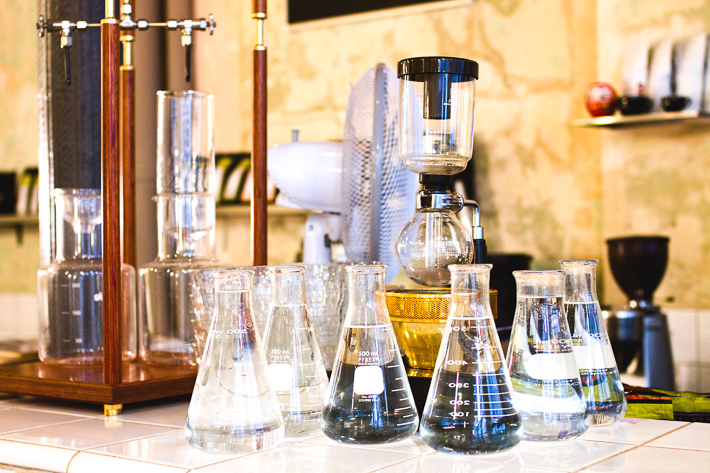 Tap water was served in the aforementioned beakers. 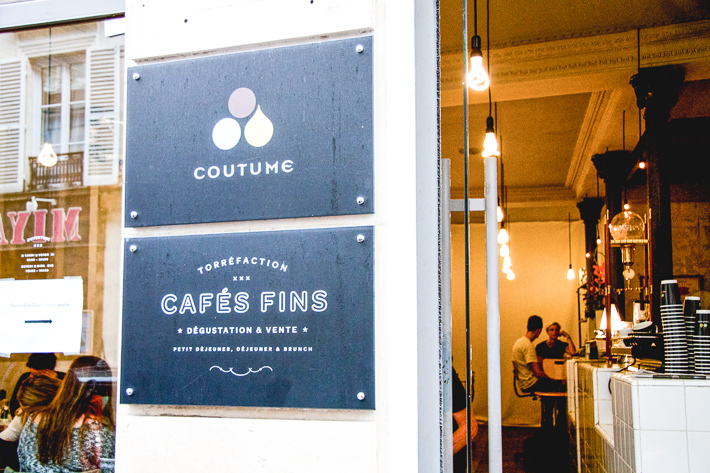 But the rest of the experience at Coutume was not as clinical – it was chill and inviting. 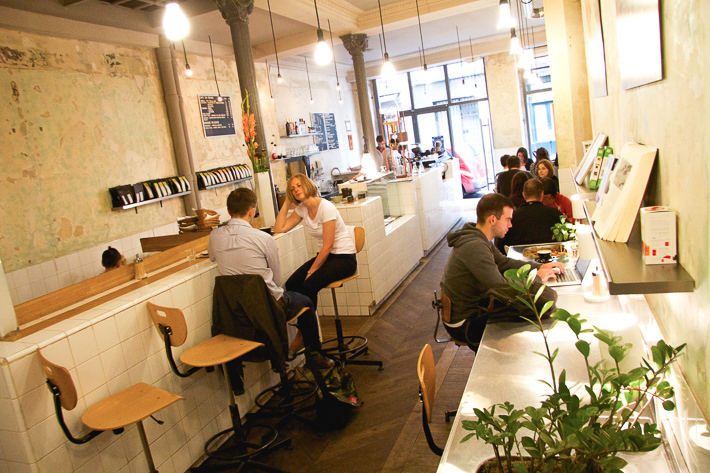 Unlike the average Parisian cafe where outdoor seating is prime, this location (the first of three different themed locales in Paris) had unfinished-looking white walls, diner style letter-boards hung up on the wall, long rows of tables and simple modern seats up front, and a stainless steel counter bar with plants in the back. Unadorned light bulbs hung from the tall ceilings, coffee-making supplies for sale in the back, and the generally relaxed and quiet vibe of the place added to the Brooklyn or Chelsea-esque feel of the place. But what about the coffee itself? 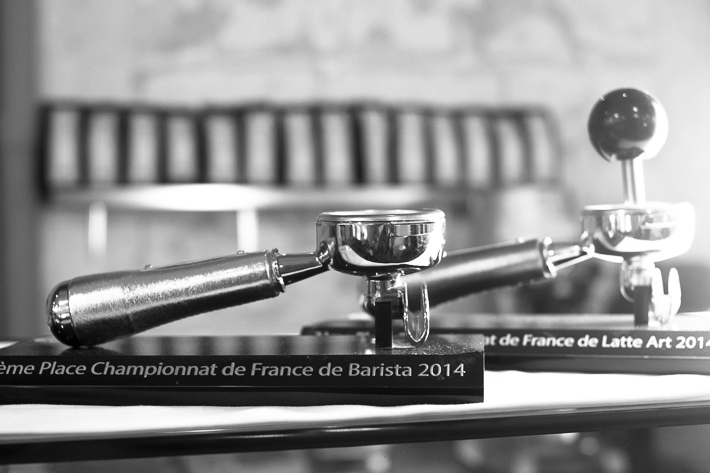 Several barista awards were also on display on the counter, attesting to the quality of their latte art, which we felt was generally a good sign. 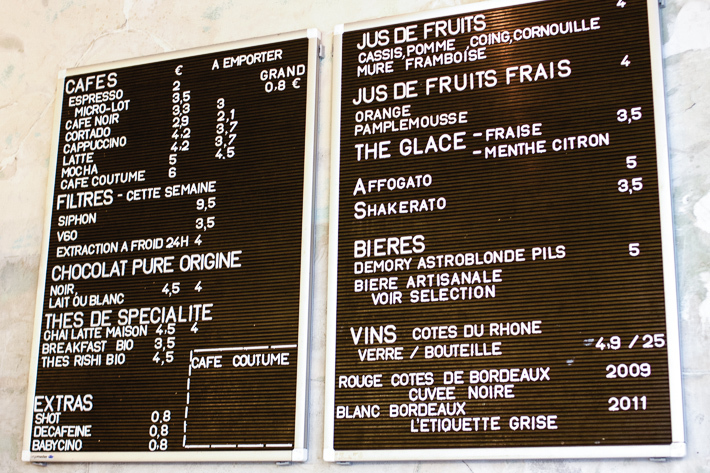 The coffee menu was extensive, listing all the usual American favorites (espresso, latte, mocha, cortado, and filtered, and iced coffee – the later something all-too-rare in Paris – along with several others). I decided to start with two: the filtered V60 and an espresso. 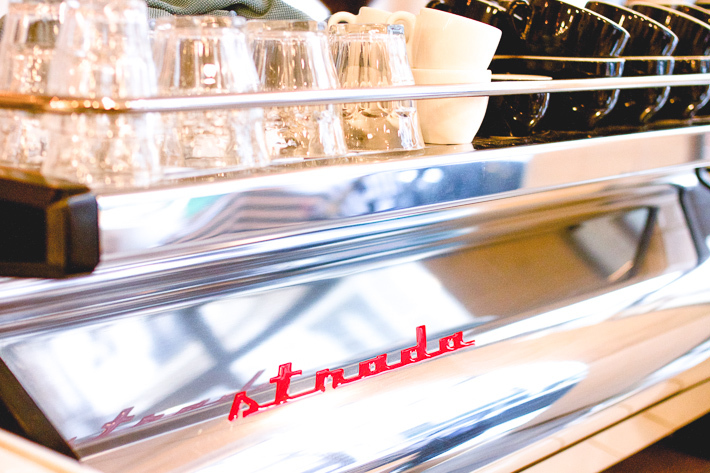 The V60, poured through at the counter, was Ethiopian that day. Served in one of their branded coffee cups, it was tasty, just a bit earthy, and light. I’m partial to Central American varieties, so it was a nice diversion from my usual routine. The second was the espresso, a small batch variety, and also very good, not at all like the typical café noir or café express served at the average Parisian cafe. It was balanced and very good. 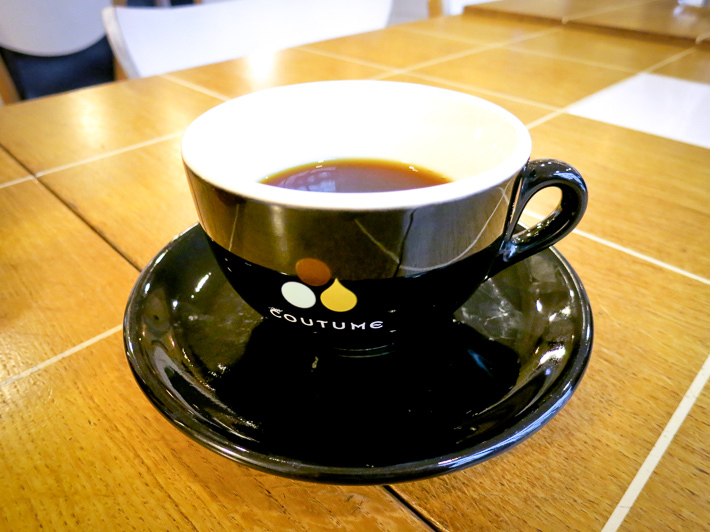 Overall, the quality of the coffee was a testament to Coutume’s high standards. (They also source and roast their own, and the offerings change on a seasonal basis). The baristas were also friendly and knowledgeable, and one even bonded with our seven-year-old daughter over Harry Potter. We then went on to try the food, because we’d heard that Coutume a destination for brunch (that most American of meals that the French have wholeheartedly adopted). We tried the mix of more conventional French and American-style offerings, and were not disappointed. While the trio of mini-pastries were fresh and perfectly flaky and delicious, it was their version of eggs Benedict that blew us away. Instead of the poached eggs and ham being served on a muffin, instead, it was served on a pancake, which was pure genius. Two hours in, we finally thought of leaving, but I was curious about what the Cafe Coutume could be, that was listed on the menu board. Our friendly caffeine-tattooed barista told us it was a drink special that changed monthly, and suggested I try it. For the month of July, it was an iced coffee with a shot of espresso, infused with almond and lavender, topped with some local milk. It tasted exactly as described (with the lavender more prominent than the almond), and it felt like a treat, or a liquid dessert, which seemed fitting after our leisurely late-morning meal. And what of the other offerings? My wife said her Breakfast Bio tea was okay but not particularly special (other than the fact that it was organic). But my daughter’s white hot chocolate (lait ou blanc) was rich, frothy, and sweet, a different take on the usual chocolat chaud at so many other cafes. Take-away coffee cups were also available (another rarity until recently in Paris), but they seemed unnecessary considering the slow-sip, while away the time, coffee-drinking lifestyle of Paris. 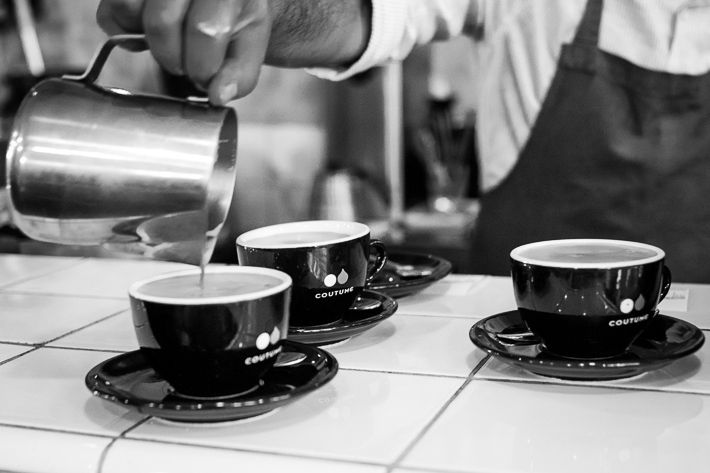 And like any good American coffee house, they had bagged varieties of their coffee for sale, and although some of their Ethiopian and a few “Grand Cru” offerings were pricey, others were less so, but still strictly for the Parisian bobos who can afford it for the home. I also noticed before leaving that they also serve beer and wine, which no doubt gives the place another dimension in the later afternoon. 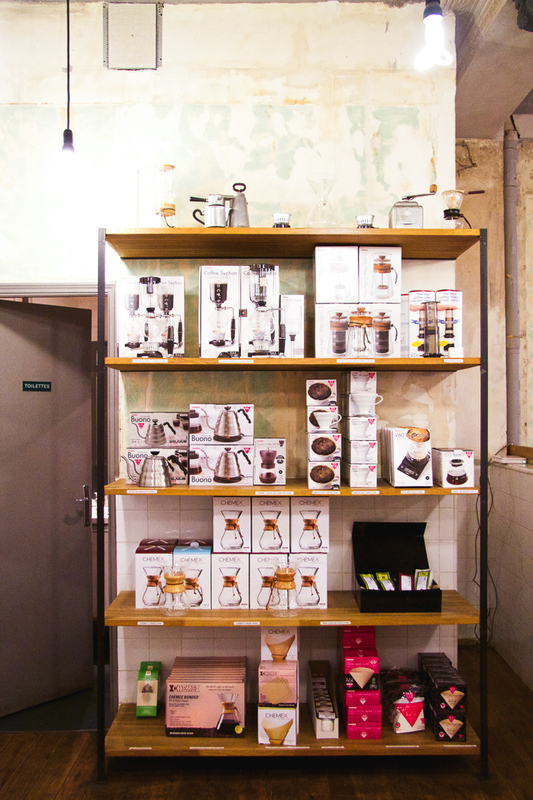 Overall, by mixing a balance of American-quality coffee culture and subtle modern French style, Coutume is a must for those in search of a java pilgrimage in Paris. Add the tasty food, and it’s proximity to the popular Le Bon Marché department store and Musée Rodin, and you’ve got yourself a great mellow day in Paris.